People's emissions are causing the planet to heat up and more than 93% of this heat goes into the oceans. People have measured ocean temperatures for a long time. Reliable records go back to at least 1880. Ever since records began, the oceans were colder than they are now. NOAA analysis shows that, on the Northern Hemisphere, the 20th century average for June is 16.4°C (61.5°F). In June 2015, it was a record 0.87°C (1.57°F) higher. Back in history, there have been times when it was warmer. The last time when it was warmer than today, during the Eemian Period, peak temperature was only a few tenths of a degree higher than today, according to the IPCC. In those days, there was huge melting, accompanied by extreme storms and sea levels that were 5 to 9 m higher than today. In many ways, the situation now already looks worse than it was in the Eemian. "The warm Atlantic surface current was weaker in the high latitude during the Eemian than today", says Henning Bauch. Carbon dioxide levels during the Eemian were well under 300 ppm. So, there could well have been more pronounced seasonal differences then, i.e. colder winters that made that the average ocean temperature didn't rise very much, despite high air temperature in summer. By contrast, today's high greenhouse levels make Earth look set for a strong ocean temperature rise. 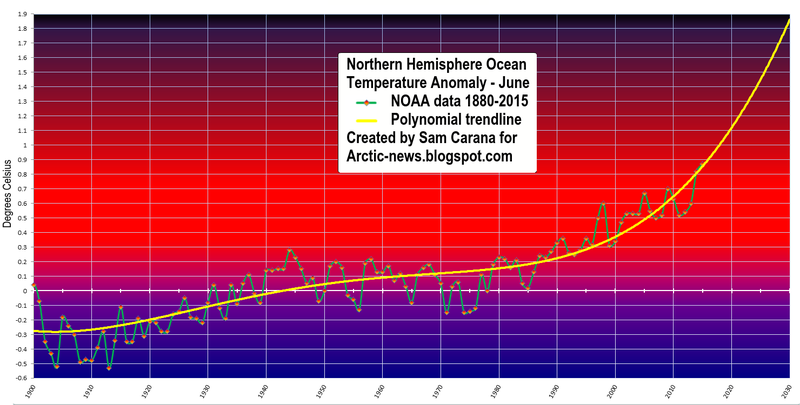 As illustrated by above image, contained in ocean temperature data from 1880 for the Northern Hemisphere is a polynomial trendline that points at a rise of almost 2°C by 2030. This indicates that temperatures across the Arctic Ocean could soon be even higher than the peak temperature was back in the Eemian Period. 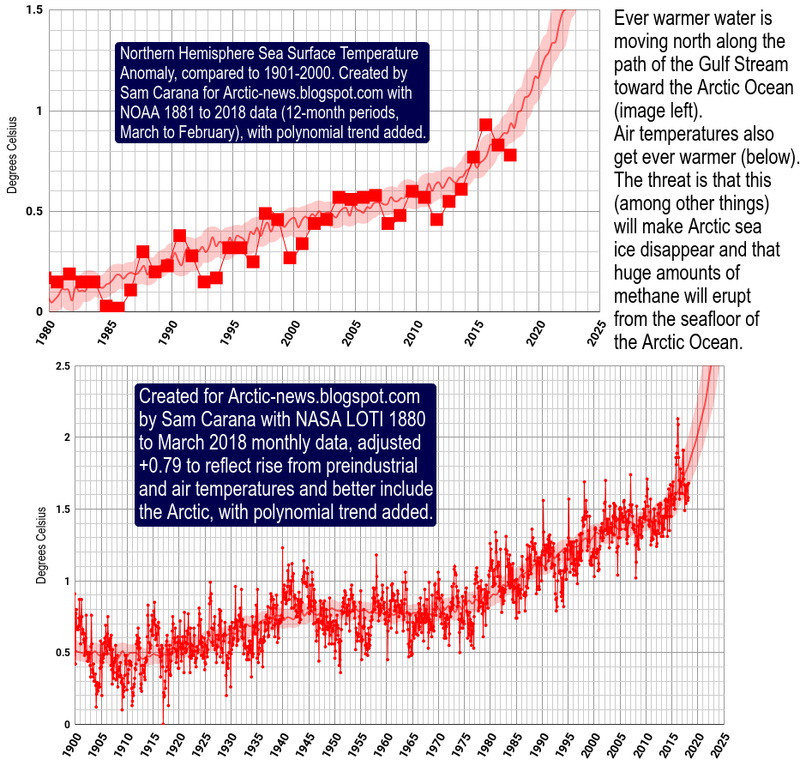 Indeed, the Arctic Ocean temperature is rising at a terrifying pace, the more so given that there seems to be no end in sight soon for this rise. This rise of almost 2°C by 2030 is not limited to the month of June. As above image shows, it applies to the 12-months period from July 2014 to June 2015 as well. 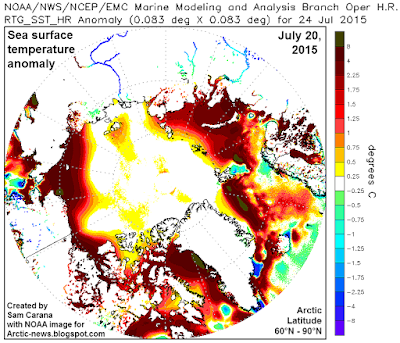 In some places, the Arctic Ocean is already very warm. 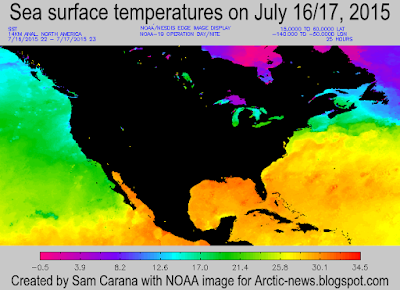 Sea surface temperatures around North America have increased to very high levels and they are threatening to further raise the temperature of the Arctic Ocean. High levels of greenhouse gases over the Arctic Ocean, as illustrated by the screenshot below showing high carbon dioxide concentrations over the Arctic (from NASA video). Furthermore, methane levels are very high over the Arctic. An earlier image showed methane levels as high as 2512 parts per billion on July 17, 2015, with high methane levels north of Greenland that also showed up on an earlier image at this post. High levels of ocean heat in the North Atlantic, as illustrated by the image below showing high sea surface temperatures off the east coast of North America; much of this ocean heat will be carried by the Gulf Stream into the Arctic Ocean over the next few months. 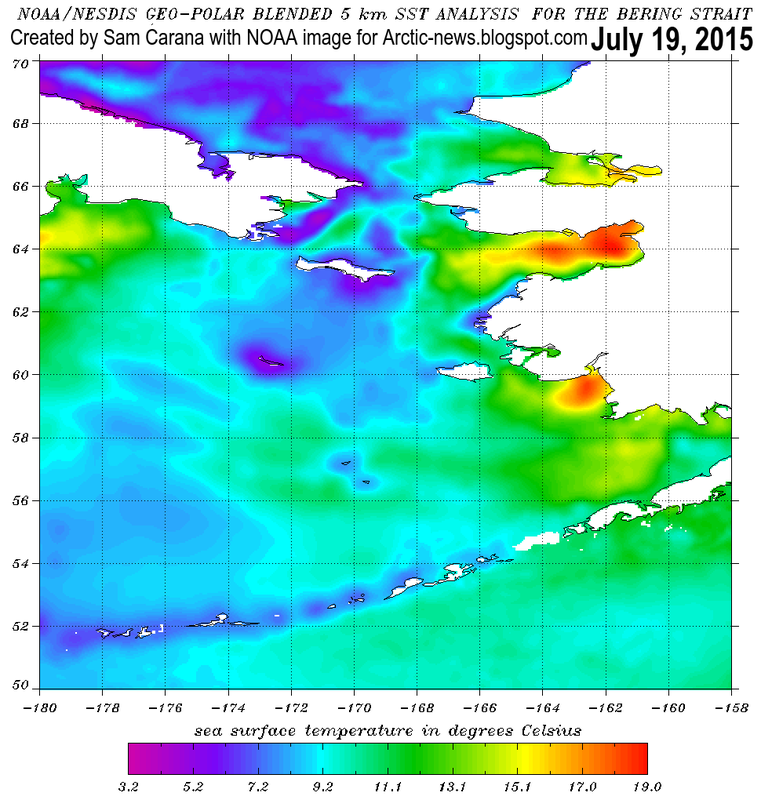 High sea surface temperatures in the Arctic Ocean, as illustrated by the image below. High air temperatures over North America and Russia extending over the Arctic Ocean, as illustrated by the image below showing a location well inside the Arctic Circle where temperatures as high as 37.1°C (98.78°F) were recorded on July 2, 2015. (green circle). 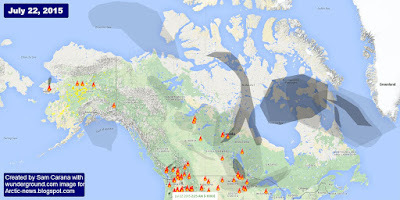 Wildfires triggered by these heatwaves resulting in darkening compounds settling on snow and ice, making it more prone to melting, as illustrated by the image below showing smoke reaching high up into the Beaufort Sea on July 22, 2015. Very warm river water running into the Arctic Ocean, as illustrated by the image below, showing sea surface temperatures as high as 19°C (66.2°F) off the coast of Alaska on July 19, 2015. The danger is that collapse of the sea ice will further accelerate warming in the Arctic, as sunlight that was previously reflected back into space and heat that previously went into melting then will all be absorbed by the Arctic. Furthermore, more open waters will increase the possibility of storms that can mix surface heat down to the bottom of the seafloor, and destabilize sediments that contain large amounts of methane in hydrates and free gas. Such feedbacks are further discussed at the feedbacks page, including the danger that further warming of the Arctic Ocean will unleash huge methane eruptions from the Arctic Ocean seafloor, in turn driving temperatures up even higher and causing more intense wildfires, heatwaves and further extreme weather events. 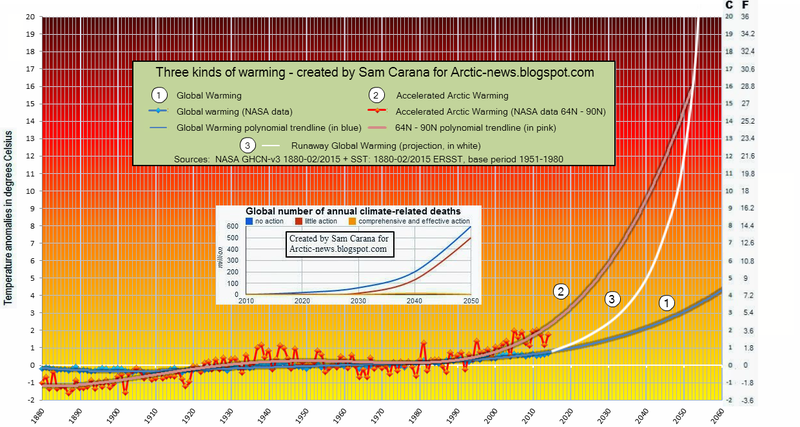 The image below shows a non-linear trend that is contained in the temperature data that NASA has gathered over the years, as described in an earlier post. A polynomial trendline points at global temperature anomalies of over 4°C by 2060. 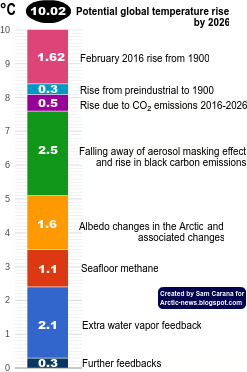 Even worse, a polynomial trend for the Arctic shows temperature anomalies of over 4°C by 2020, 6°C by 2030 and 15°C by 2050, threatening to cause major feedbacks to kick in, including albedo changes and methane releases that will trigger runaway global warming that looks set to eventually catch up with accelerated warming in the Arctic and result in global temperature anomalies of 16°C by 2052. The focus of world must be keeping Earth, Home not the accumulation of consumer goods or security. There is a large enough reason for peace in the world today and it can be made as real as possible by changing contract law value of money relative to its usefulness to peace and best effort at keeping Sea. The Sea carbonate balance is in shock and way to keep Earth if we can is to shock world Enterprise. Time and the advance of Abrupt Climate Change doesn't allow some choices that would be otherwise available..